Note: Please also see the Southeast wiki. This is the list of Alabama Mapping Resources that are generally regarded as safe. 1.1.1 Driving on divided highways. 1.1.2 Turning on curve or crest of grade prohibited. No vehicle shall be driven over, across, or within any such dividing space, barrier or section, except through an opening in such physical barrier or dividing section or space or at a cross-over or intersection as established, unless specifically prohibited by public authority. 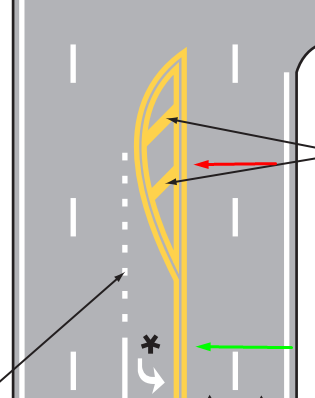 This means in AL it is illegal to cross a lined median (quad yellow lined median with or without diagonal lines or chevrons.) unless it has an "opening" which means it stops or is broken lined in a uniform manner. red= dividing space. Illegal to enter for any movements. Section 32-5A-131 (a) The driver of any vehicle shall not turn such vehicle so as to proceed in the opposite direction unless such movement can be made in safety and without interfering with other traffic. (b) No vehicle shall be turned so as to proceed in the opposite direction upon any curve, or upon the approach to or near the crest of a grade, where such vehicle cannot be seen by the driver of any other vehicle approaching from either direction within 500 feet. Self Explanatory. Don't allow a U-Turn in AL in a situation that violates this law. The County Assessors in the counties below makes every effort to produce the most accurate information possible. No warranties, expressed or implied are provided for the data herein, its use or interpretation. The assessment information is from the last certified tax roll. All other data is subject to change.